Although their existence is undeniable, astronomers across the world are still unsure of how supermassive black holes actually form. An EU-funded project has set out to answer this question by simulating the formation and growth of their seeds – black holes created when an extremely massive star collapses. This is one of the most puzzling questions in astronomy: How were supermassive black holes able to form in the early cosmic ages? Distant luminous quasars have been observed that betray their existence back when the universe was less than a billion years old. But here is the thing: the conventional growth process of a black hole is way too slow to allow their existence. There are potential explanations. It has been said, for example, that these supermassive black holes were born from the explosion of supermassive stars, from the collapse of large clouds of gas, or even from collisions between smaller black holes. 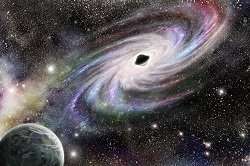 The theory that retained the attention of Dr Muhammad Latif, however, was that such black holes actually grew from extremely large, 'direct-collapse' seed black holes. Thanks to funding under the FIRSTBHS (The formation of supermassive black holes in the early universe) project, Dr Latif simulated the formation and growth of these seeds. What makes the first supermassive black holes so interesting? The first supermassive black holes are very interesting as they were formed in the infant universe, within the first billion years after the Bing Bang, only a tiny fraction of the universe's current age (13.7 billion years). They challenge our understanding of structure formation in the universe. A good analogy would be a situation where you would go to a kindergarten and find a seven-feet-tall kid. You will of course wonder how this kid was ever able to grow to such a height. It's the same with these black holes: their masses are billions of times bigger than that of our Sun, and it's difficult to comprehend how they could become so massive in such a short timeframe, when stars and galaxies just began to form. More specifically, what knowledge gaps did you aim to close with this project? We aimed to understand what the most feasible way to assemble such massive objects would be. There are three main astrophysical mechanisms that could lead to the formation of the first supermassive black holes. The most promising scenario is the so-called direct collapse method: It provides massive seeds, which makes their growth easier. With this project, we aimed to explore the feasibility of this scenario, how massive the seeds it can provide are and how abundant they are, compare their number density with observations and investigate in detail the underlying astrophysical mechanisms. We further aimed to derive their observational signatures and make predictions for upcoming space and ground based missions. How did you proceed to do so? We performed so-called three dimensional cosmological simulations starting from ab initio initial conditions by modelling in detail all the necessary physical processes. What would you say were the most innovative aspects of this methodology? I would say that it's the multi-physics of our cosmological simulation, which included detailed chemical and unresolved turbulence models, magnetic fields, radiative transfer to model UV, X-ray feedback from accreting black hole and stars, as well as metal enrichment. This approach is beyond the state-of-the-art in the field. What were the most important findings from the project? Our results show that the direct-collapse mechanism provides massive seed black holes of 10^5 to 10^6 solar masses, which may grow to form the first supermassive black holes. The conditions for the formation of such objects are ideal in the early universe. Particularly, the pristine massive halos illuminated by strong UV flux are the potential cradles for the formation of massive black holes. Our findings suggest that such objects are rare, as they require special conditions to form – but this is still being debated among experts. What do you expect from the JWST and ATHENA missions? We are hoping that JWST will find some of the seed black holes, as these distant objects are quite faint at early stages. Of course, it also depends how abundant they are, which is still an open question. ATHENA looks more promising, as it is expected to detect a few hundred low-luminosity AGN at z>6 which will help to constrain black hole formation models. What are your follow-up plans, if any? We are currently investigating the growth of black holes in the early universe for which we have performed detailed simulations. With my collaborators, we are trying to understand how feedback from the black hole and stars affects the growth of black holes, and also the role of environment, cold streams which feed these black holes, etc. We aim to derive synthetic observables for E-ELT, Euclid, ATHENA, JWST and SKA, and we hope that such an approach will help us to understand the formation and growth of the first supermassive black holes.